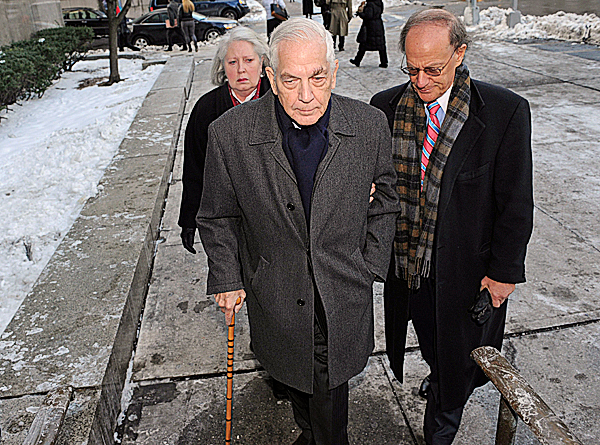 MOUNT DESERT, Maine — The son of philanthropist and New York society doyenne Brooke Astor, who summered for decades in the village of Northeast Harbor, was sentenced Monday to serve one to three years behind bars for illegally plundering his mother’s estate. Anthony Marshall, 85, was convicted two months ago in a New York courtroom of stealing from his mother’s nearly $200 million fortune as she grew older and began to suffer from Alzheimer’s disease. Marshall faced as many as 25 years in prison after being convicted of 14 counts, including grand larceny and scheming to defraud. Former local employees of Astor’s, who died in 2007 at the age of 105, said Monday that Marshall deserves to go to jail. Marshall is the owner of Astor’s former estate, Cove End, which overlooks the yacht club on Gilpatrick Cove. For tax purposes, the town has assessed the value of the 3-acre parcel and house at $3.2 million. Marshall was given 30 days by the judge to get his affairs in order before reporting to prison, but might be able to delay his incarceration if he appeals the conviction. Two former local employees of Astor said Monday that Marshall went against his mother’s wishes when he pushed through changes to her will before she died. Marshall also was accused of improperly transferring control of some of his mother’s assets, including real estate, art and jewelry, to himself and his wife, former resident Charlene Marshall. Steven Hamor and Alicia Johnson each said Astor told them she would remember them in her will but that the Marshalls have not made good on those promises. Hamor, 66, was Astor’s head gardener for 41 years while Johnson, 57, was her head housekeeper for more than a decade. Johnson suggested Monday that the real beneficiary of Anthony Marshall’s actions was Charlene Marshall, who is 20 years younger than her husband. Charlene Marshall and Astor did not get along, according to witnesses and prosecutors, and the daughter-in-law stood to inherit nothing if her husband died before his mother did. Charlene Marshall, who was never charged with any criminal wrongdoing, divorced a local minister before marrying Anthony Marshall in 1992. Residents have said that Astor was mortified when her son began dating the ex-wife of her summertime pastor. Charlene Marshall owns six other former Astor properties adjacent to Cove End that have a total assessed value of $4.7 million, according to information listed in the town’s official online assessment database. Hamor was Astor’s gardener until he was laid off by the Marshalls in 2006. He said his two sons and wife also worked for Astor at one time or another. According to Hamor, Marshall is guilty and his age is no reason to keep him out of prison, even if his health is not good. He said he thinks Marshall felt pressure to provide for his wife’s future. “I feel sorry for Mr. Marshall, in a way,” Hamor said. Hamor said that Astor treated her employees well and that she would be greatly embarrassed by the scandal that tore her family apart at the end of her life. The allegations against Anthony Marshall surfaced in 2006 after his son, Philip Marshall, petitioned the courts to have his father removed as Astor’s guardian. Philip Marshall claimed his father was neglecting Astor’s well-being while assuming control of her money. During the trial, several of Astor’s powerful friends, including Barbara Walters and seasonal Mount Desert Island resident David Rockefeller, testified about Astor’s mental decline and care. Marshall has his own famous supporters, including television weatherman Al Roker and actress Whoopi Goldberg, who wrote letters to the judge asking for leniency. Astor gave away $200 million during her lifetime, much of it to institutions in New York; she also gave to local organizations. In her will, Astor left money to College of the Atlantic, Asticou Azalea Garden, Northeast Harbor Library, and to Saint Mary’s and Saint Jude’s Parish.